One of the most iconic burns in the history of The Simpsons occurs in the episode “Two Dozen and One Greyhounds.” In the wake of a botched dinner party, Rev. Lovejoy storms out of the Simpsons’ dining room and yells, “See you in hell!” before slamming the door. Taking a beat, he re-opens it to smugly add “from heaven”—and slams it again. In artist Craig Calderwood's hands, that line, which titles their latest show at the Luggage Store Gallery, is less of a reference to the sitcom and more of a riff on the catty, religious certainty that shades Lovejoy’s clapback. As a phrase, “see you in hell, from heaven” packs a linguistic wallop, a zinger of immeasurable sass that is literally cosmic in scope. But even if you divorce the remark from its holier-than-thou connotations, you are still left with a taste of the world’s oldest binary thinking—the good go up, the bad go down, and I know exactly where you stand. It’s a kind of mindset that Calderwood has little use for, one that is far too convenient to actually express the complexities and contradictions that are part and parcel of being a person, especially a queer person. Calderwood’s work thrives on complications. In keeping with queer art traditions from Warhol to Caravaggio, Calderwood takes on the static meaning in everyday symbols and expands them light-years beyond their dictionary definitions. Throughout their show, Calderwood (who uses she/her and they/them pronouns) embeds one loaded image after another to create portraits that are unified by style, but alive with tensions. Calderwood’s drive to complicate manifests itself on the most basic level, in the raw material of their work. The show was originally conceived as an exploration of humbler art techniques, and for See You in Hell Calderwood returned to the craft supplies from the bible camp they attended as a child. Working with these media is a technical challenge that Calderwood nails to impressive effect. Wielding dimensional paint and polymer clay to create impossibly detailed paintings and brittle but fleshy sculptures, there is not a single piece within their show that looks remotely gimmicky. The visual language that Calderwood develops over the course of the exhibition is as much a show of exuberance as it is a product of concern for safety. Calderwood's work is by no means closeted, but it does hold its riches close to its chest. Their paintings look markedly different from a distance; photographs do not do justice to the artworks’ complexity or emotional impact. 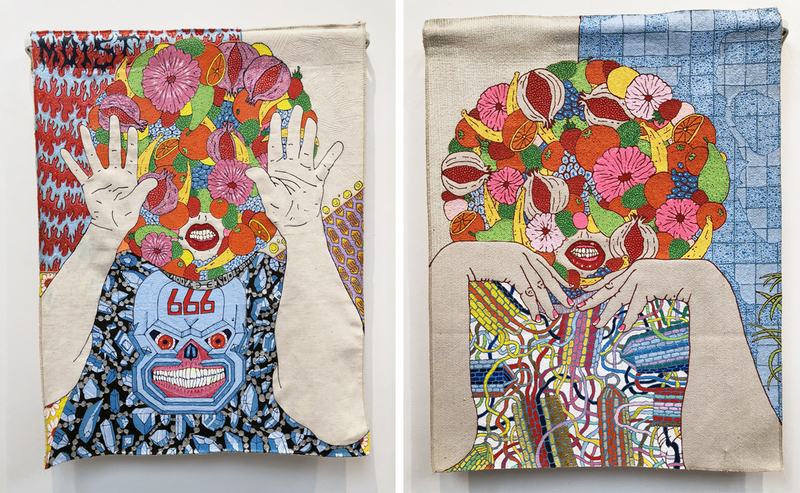 Shown side-by-side, the paintings 100% Pisces and Gift Giver depict the same fruit-headed character with slightly differing hand gestures—the former holding its hands up against a flurry of the Stussy S with a Terminator skull affixed to its chest, the latter folding its hands over multi-color lanyards. The former character is outlined in blue dimensional paint, the latter in pink. 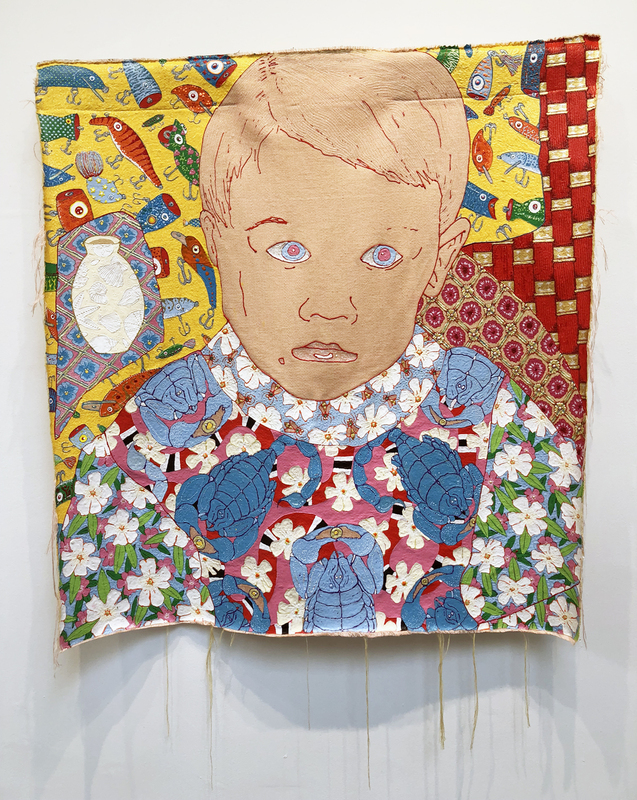 We All Knew initially scans as Calderwood's answer to David Wojnarowicz's Untitled (One day this kid...), a photo-based print of a queer child soon to be overwhelmed by the world around them. But where Wojnarowicz created his picture with words, Calderwood visualizes that world in gorgeous color detail. Fish and fishing are prominent motifs throughout See You in Hell—Calderwood is after all "100% Pisces"—but the lures that background their subject in We All Knew are not simply out to get them. "It's a masculinized craft act," Calderwood says of lure making, "which is strange to me because it [can be] just as fussy as making jewelry." Instantly the painting complicates just what "we all knew"; perhaps this isn't simply the breaking of a child, but the making of an artist. Calderwood has professed an interest in chthonic spaces, previously invisible scientific underworlds host to giant squid and bioluminescent fish. Even if many of the more figurative works bear a similarity to Calderwood—a function of "convenience over narcissism," as they hilariously put it—the odd appearances of the fruit-headed characters and wig-wearing queen in How's Your Jesus Christ Hanging? seem adaptive in a mutant kind of way, commanding their surroundings with an easy, funny grace. 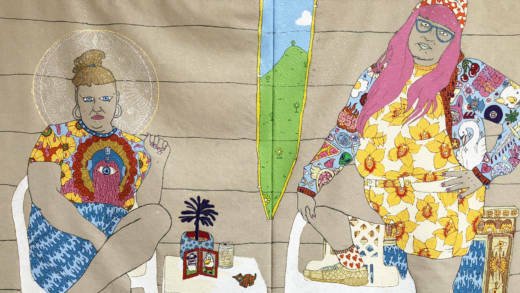 In the show's titular piece, two figures pose regally wearing their entire lives on their sleeves—images of weed, bats, pentagrams, flowers and the text of insults. If Calderwood's characters operate in any space, it is neither heaven nor hell, but at the bottom of the ocean, where they've adapted beautifully to living under pressure. 'See You In Hell, From Heaven' is on view at San Francisco's Luggage Store Gallery through Oct. 6, 2018. Details here.